Conic sections can be described or illustrated with exactly what their name suggests: cones. Imagine an orange cone in the street, steering you in the right direction. Then picture some clever highway engineer placing one cone on top of the other, tip to tip. That engineer is trying to demonstrate how you can create conic sections. If you come along and slice one of those cones parallel to the ground, the cut edges form a circle. Slice the cone on an angle, and you have an ellipse. Slice the cone parallel to one of the sides, and you have a parabola. And, finally, slice through both cones together, perpendicular to the ground, and you have a hyperbola. If these descriptions just don’t work for you, the practice problems should do the trick. 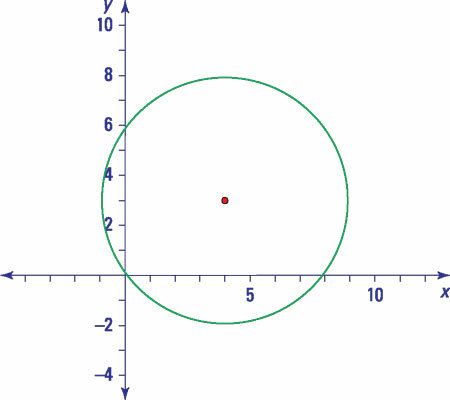 Name the conic and its center. The given equation is already in this form, so you can identify the center coordinates by looking at the values substituted for h and k.